Vietnam National University at Hanoi, Educational Physics – B.S. Vietnam National University at Hanoi, Theoretical Physics- M.S. 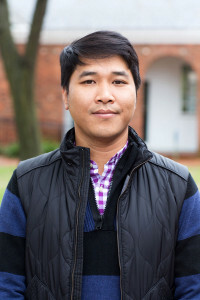 University of Virginia, Theoretical High Energy Physics – Ph.D.
Dr. Hoang believes that the goal of education should be to encourage students to seek answers. Whether instructing in the physics lab, or leading the discussion in calculus problem-solving sessions, Dr. Hoang allows CBGS students to take the central role in the process of discovery using logical reasoning. Dr. Hoang encourages his students to hone their curiosity not only in the classroom, but also through field studies. He weaves examples from fieldwork into classroom lectures and demonstrations. “We are surrounded by amazing things, which are governed by hidden rules and laws of nature and society…Learning from classrooms gives us a living, and self-education gives us a fortune”. Dr. Hoang is also a huge fan of the Manchester United soccer team, and enjoys photography and playing guitar.